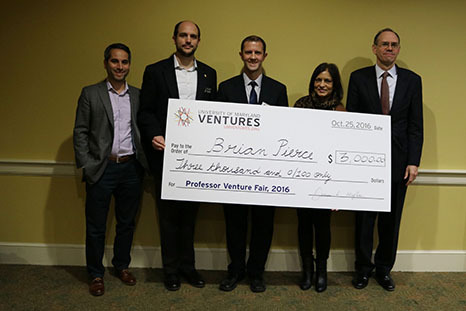 The University of Maryland (UMD) hosted its 10th annual Professor Venture Fair on October 25, 2016 in the Grand Ballroom Lounge of Stamp Student Union. Part of Bioscience Day, an event presented by the College of Computer, Mathematical, & Natural Sciences, the Professor Venture Fair gives faculty members the opportunity to pitch their inventions to a panel of expert advisors, investors and entrepreneurs from the region. Brian Pierce, Assistant Professor at UMD’s Institute for Bioscience and Biotechnology Research (IBBR), uses protein docking and protein design algorithms to understand how the immune system recognizes pathogen molecules, including from the relentlessly mutating hepatitis C virus. Using this information, he and his team have designed variations of these viral molecules that serve as ideal vaccine candidates against the hepatitis C virus, which infects nearly 3 percent of the global population, leading in many cases to liver cancer and liver disease. "A vaccine for hepatitis C would have a tremendous impact, particularly as no approved vaccine is currently available, and recently developed antivirals, while mostly effective, are costly and can be given too late to prevent liver damage, ” said Pierce. His team is comprised of members from IBBR, UMD: Roy Mariuzza, Yili Li, and Thomas Fuerst, Director of IBBR, and members from Stanford University: Steven Foung and Zhen-Yong Keck. “It's very exciting to me that computational protein design can be used to improve medicine and human health through engineered vaccines and biologics, and having an interdisciplinary team such as ours that can characterize and validate designs as they move toward the clinic is key,” said Pierce. “UMD's Office of Technology Commercialization has been highly supportive of this and other projects where we are generating novel molecules and approaches to combat viruses." At the Professor Venture Fair, he presented these new rational design approaches to develop hepatitis C vaccines, winning the best pitch and an award of $3,000 sponsored by UM Ventures, a joint initiative of the MPowering the State Program, that brings together the University of Maryland, Baltimore and University of Maryland, College Park to commercialize technology. Ashok Agrawala, Professor at UMD College of Computer, Mathematical and Natural Sciences, Department of Computer Science, Department of Computer and Electrical Engineering, and University of Maryland Institute for Advanced Computer Studies proposed the Simetric system of using virtual reality headsets to allow pediatric patients to virtually experience procedures they are scheduled to undergo in order to reduce fear and increase their understanding of what will occur during the procedure. Ashok developed the Simetric system with his graduate student, Elissa Redmiles. Lai-Xi Wang, Professor at UMD College of Computer, Mathematical and Natural Sciences, Department of Chemistry and Biochemistry focuses on chemical biology of protein glycosylation, glycoengineering of therapeutic antibodies and HIV vaccine design. At the Professor Venture Fair he presented a method for increasing the effectiveness of therapeutic antibodies by manipulating their glycosylation or the type and distribution of sugars present on these antibodies. The annual Professor Venture Fair is organized by the Office of Technology Commercialization and is part of UMD Bioscience Day, a daylong event on the College Park campus that features research talks, presentations, mini-symposia and demonstrations by University of Maryland scientists. This year’s seminar themes were Ecology and Evolution and Neuroscience. The Professor Venture Fair was followed by a Fireside Chat with Associate Vice President for Innovation and Entrepreneurship Dean Chang and Associate Professor of Environmental Science and Technology David Tilley, who discussed the NSF I-Corps lean startup model and encouraged bioscience students to engage in evidence-based entrepreneurship. Bioscience Day continued with poster presentations, networking panel sessions, seminars, and a keynote lecture. For more information, visit the Bioscience Day website.